Cold Spring Harbor, NY — Something rotten never smelled so sweet. This is what members of a team of scientists at Cold Spring Harbor Laboratory (CSHL) are telling one another as they discuss a new finding they did not expect to make. They have discovered that hydrogen sulfide (H2S)—the flammable, highly toxic gas that we usually associate with the smell of rotten eggs in landfills and sewers—plays an important role in the regulation of a signaling pathway implicated in biological malfunctions linked to Alzheimer’s and Parkinson’s diseases, among others. 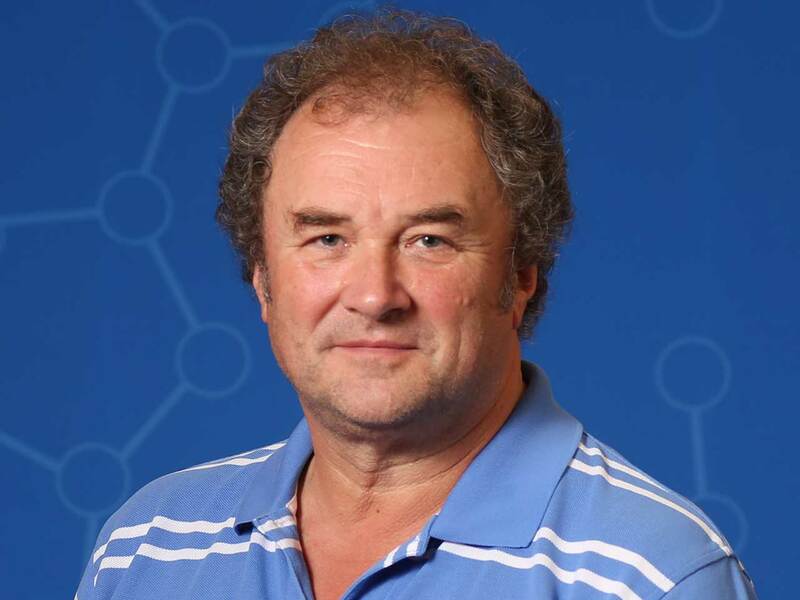 “H2S comes under the category of things that people think of as toxic and nasty, but which can actually be harnessed to serve a useful purpose,” says CSHL Professor Nicholas K. Tonks, FRS, who led the research team. In fact, H2S, which is produced naturally in small quantities in various tissues, is a gasotransmitter, one of a family of gaseous signaling molecules that includes nitrous oxide (NO) and carbon monoxide (CO). Unlike growth factors, cytokines and hormones that act through receptors in the cell membrane, these gasotransmitters are able to permeate membranes and enter freely the interior of living cells. Tonks and colleagues were intrigued by reports in the scientific literature suggesting that H2S was produced as part of the cell’s response to what is called ER stress. The ER is the cellular organ called the endoplasmic reticulum. It is an extensive network of membranes spread throughout the cytosol, which is involved in protein synthesis and processing. When proteins are misfolded in response to cellular stress, the inactivation and reactivation of PTP1B appears one means by which the cell regulates its protein synthesis machinery and can exert tight control over whether it lives or dies. When the cell is placed under stress, specifically when newly formed proteins are being manufactured in the ER so rapidly that they do not fold properly, rendering them non-functional, the cell must make a decision either to slow protein production to match its physiological requirements, which could restore proper protein folding, or, if that is not sufficient, to commit a form of suicide called apoptosis. The surprise in the research performed by Tonks’ team—which is published online today in Science Signaling—is that H2S plays a critical role in the exquisitely tuned signaling pathway through which cells make this fateful determination. Navasona Krishnan, a postdoctoral fellow, performed an experiment to determine whether H2S could covalently modify an enzyme called PTP1B. Discovered by Tonks in 1988, PTP1B is a protein tyrosine phosphatase, or PTP—an enzyme that specifically removes phosphate groups from amino acid residues called tyrosines. This function is critical in regulating cellular signaling in normal and disease conditions. H2S did indeed modify PTP1B, specifically on a cysteine amino acid residue in the enzyme’s active site, which inactivated the enzyme. A number of subsequent experiments performed in collaboration with CSHL Professor Darryl Pappin, who directs the proteomics Shared Resource at the Laboratory, identified this modification and revealed that it occurred in vitro and in vivo. Because PTP1B is itself a signaling pathway regulator, this inactivation was immediately understood to be important and potentially useful. Further experimentation revealed that the H2S-induced modification to PTP1B prevented this phosphatase from inactivating an enzyme called PERK, which is a sensor of the presence of unfolded proteins and a critical regulator of the cell’s response to ER stress. The completed puzzle is as follows: small amounts of hydrogen sulfide are produced when the cell senses ER stress; PTP1B undergoes a unique covalent modification at its active site in response to the H2S that is produced, which in turn prevents the phosphatase from dephosphorylating PERK thereby allowing the latter protein to play its specific regulatory role in response to the stress. Importantly, the process is fully reversible, such that this previously undiscovered pathway can act like a switch, to help fine-tune a response to stress that potentially can lead to cell death. “We hypothesize that the controlled production of H2S could have a profound impact on how this part of the ER stress pathway—the PERK ‘arm’—is regulated. When proteins are misfolded in response to cellular stress, the inactivation and reactivation of PTP1B appears to be one means by which the cell regulates its protein synthesis machinery and can exert tight control over whether it lives or dies,” says Tonks. This research was supported by grants from the National Institutes of Health and the CSHL Cancer Center. Additional support was provided by the Irving Hansen Foundation and the Masthead Cove Yacht Club Carol Marcincuk Fund. “H2S-Induced sulfhydration of PTP1B and its role in the endoplasmic reticulum stress response,” was published December 13, 2011 in Science Signaling. The authors are: Navasona Krishnan, Cexiong Fu, Darryl Pappin and Nicholas K. Tonks. The paper is available online at: http://stke.sciencemag.org/index.dtl after 2pm ET December 13.